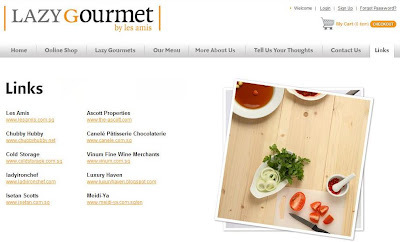 You are here:Home » Dining Reviews » Shirley's Luxury Haven At Lazy Gourmet!! Lazy Gourmet, the baby of the infamous Les Amis Group, a brand name associated with a rich & sophiscated fine dining experience. And yes, Luxury Indulgence has just crossed another milestone. You can now find her at their website. Congrats! for all ur achievements and awards... great job. YOu can become my mentor :D. Do drop by when u ronline, tks! This is Jasmine from Lazy Gourmet. We were more than happy to list you on our site and glad that you enjoyed the food we tried (as well as your recipe on the seafood rolls with our Mushroom Alfredo). If you try any more of the dishes and come up with more great recipes, do let us know. Your blog always makes for an interesting read. Looking forward to more posts!